Absolutely amazing, now I'm going to badger some friends to drive me out there. I have to admit, being a righty I don't give much thought to those left out/behind (pun intended) by the manufacturers. Take a look at Ferguson Cumberbatch's Writing Wrong(Handed) blog, I do like his handwriting. I love slim fountain pens that fit snugly in my hand, so the Lamy CP1 Titanium Fountain Pen was certainly on my list to add to my collection. This is a light-weight pen with a sleek design: the titanium body has a matte black lacquer finish, an impressive brushed steel clip, and a thin, pointy polished steel nib. The fine nib writes more like a medium to my eye, but other than that it's a great writing instrument. If you like to post your cap, that detail seems to add to the overall appeal of the pen as it makes it seem slimmer yet more substantial at the same time. And if you are interested in details, on the side of the clip is the word "Lamy", while under the clip it says "Germany." The CP1 also comes with a converter so you don't have to remember to get one, and the stainless steel case is an added bonus. Overall this is a beautiful fountain pen at a very good price, and if you are looking for something slim and sleek the Lamy CP1 fits that description perfectly. 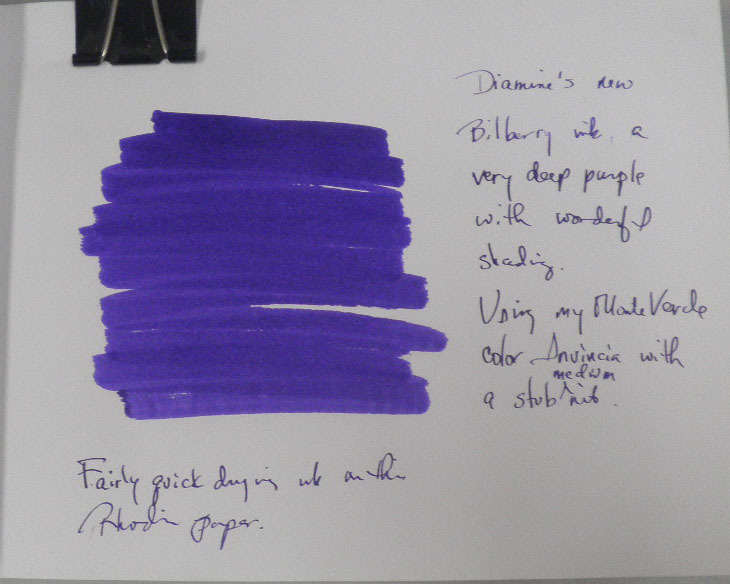 One of the new Diamine inks is Bilberry, a really deep purple with the barest hint of blue in it. I had to give this a long, hard look to see if the color was a true purple or whether it leaned to blue or red, and I have to say it does go a touch to the blue side. 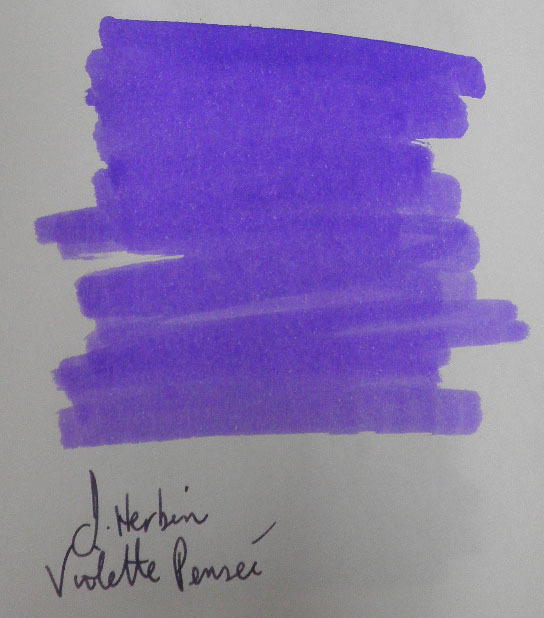 Two other colors to show against it are EVERFLO Orchid (below) and J. Herbin Violette Pensee (right). Both are truer purple colors, no where near as dark as Bilberry. Drying time is okay, my Monte Verde Invincia medium nib might have had more to do with the large amount of ink laid down than for that to be a quality of the ink itself. And it's not water resistant, so if you get your writing wet it will definitely fade. 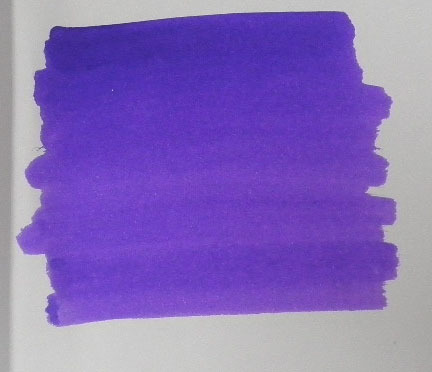 But I'm more interested in the color, which does have a beautiful subtle shading to it. Definitely if you want something a bit more interesting than black you should try out this new Diamine color (and take a look at Ancient Copper as well). 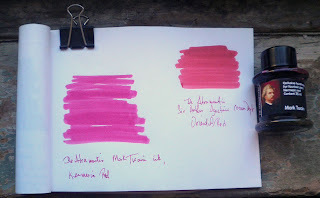 Looking through Art Brown the other day I came across this De Atramentis "historical persons" ink named for Mark Twain and described as Kermesin Red, or crimson. The above picture shows the Mark Twain on the left, with another of my favorite De Atramentis red inks, Sir Arthur Ignatius Conan Doyle, on the right. I think this is a great way to show the difference between the crimson Mark Twain color, which in the cooler red-blue range, and the Conan Doyle ink, which tends to scarlet and definitely shows red-yellow. The Mark Twain is different, something that really stands out from many of the reds I have, which tend to be warmer toned. Drying time on the Mark Twain is average, not particularly fast or show. The ink isn't water resistant, so you're talking watercolor if you get your writing wet. Looking for a beautiful red-blue ink? This might be your best choice. 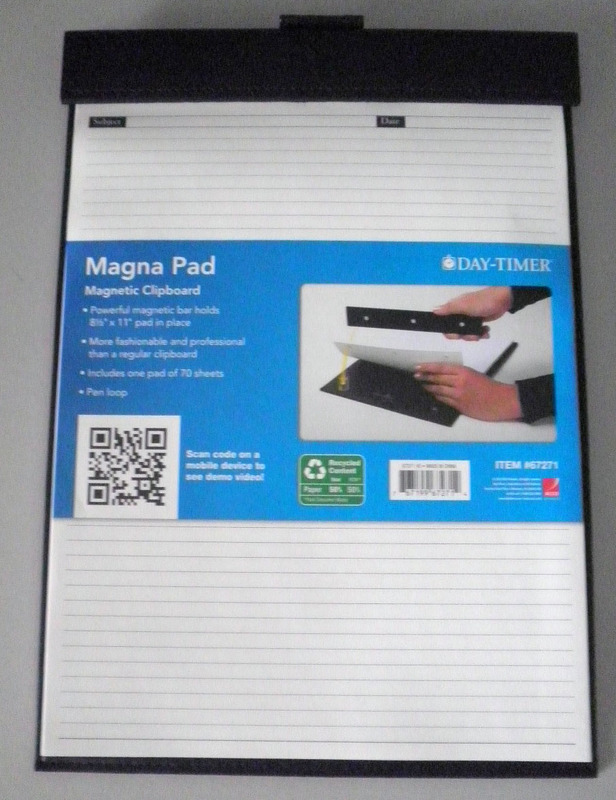 The Day-Timer Magna Pad is a great faux leather clipboard that uses magnets to keep the pad secured to the backboard. Three steel posts hold the notepad in place, while the top easily snaps apart to allow for the paper to be turned over or a new pad inserted. 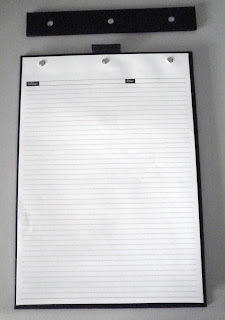 The strong backboard, which holds notepads measuring 8.5 by 11, allows for a level writing surface. 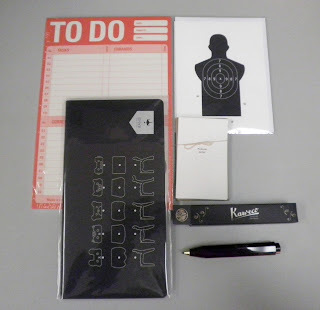 There is also an attached holder to keep your pen or pencil in place and easily accessible. The notepads, which are made from 50% post consumer recycled paper, are quite thick and definitely gel ink friendly. 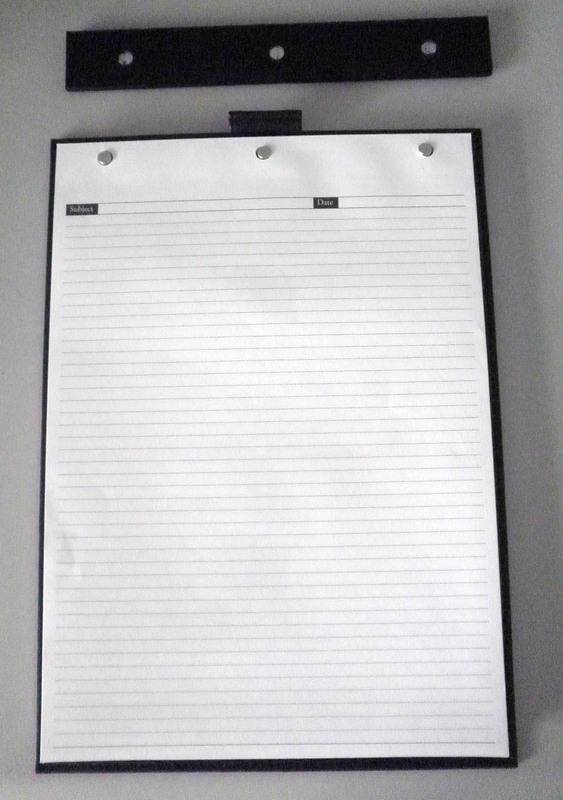 The paper also comes in several styles, including lined, notation, graph, and story board. 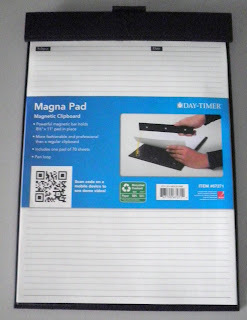 The Staples price is definitely easy on the wallet, both for the Magna Pad and the paper refills. At Day-Timer, you have different color options as well as a smaller, jotter-style size that is easier to carry. This is definitely something to check out if you are looking for a new clipboard with a bit more style and ease of use. 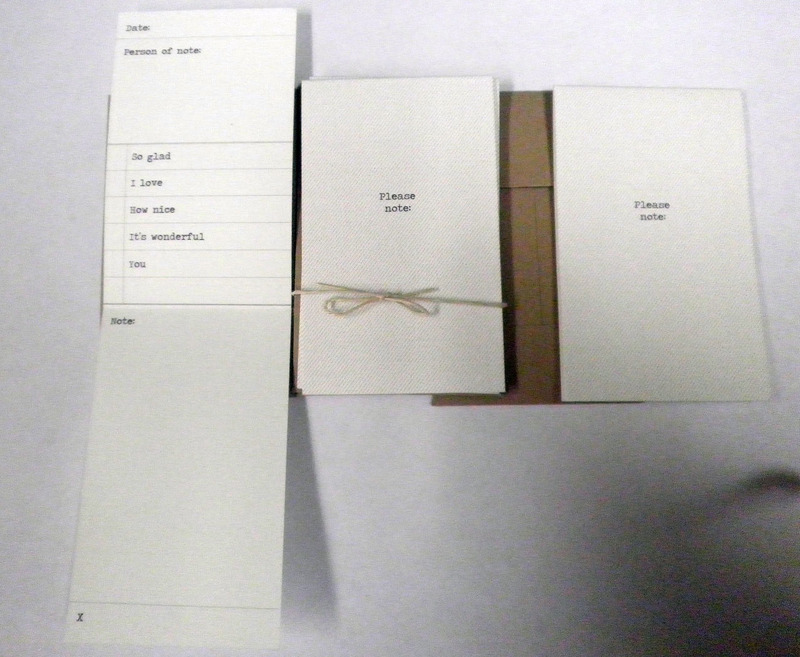 One item from my recent Lost Crates shipment were these Paper & Type Little Notes, a set of 5 small (2 1/8" by 3 1/2" folded) note cards with complementary envelopes that help you put your thoughts on paper. Just fill in the blanks by adding the date, person of note, then check off the beginning (so glad, I love, How nice), and add your personal message. There's a signature line at the bottom, and that's it. Writing was never easier, though the smallness of the note makes brevity a must. Simple in design, these Little Notes are big on creativity. Do check out some of Paper & Type's other stationery products as well as their website, their designs are definitely in the elegant category. 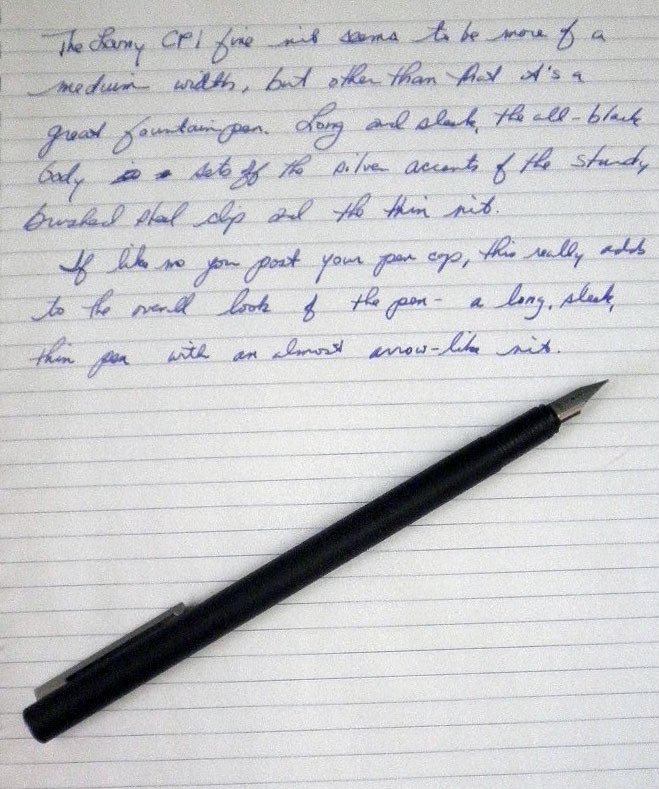 A review of the Smencil, a pencil with watermelon scent, over at the new blog Lost Scribe. I can almost smell this, do go take a look. Here's an interesting ballpoint, the Kaweco Classic Sport. It's a small pen, measuring 4.5 inches and so it's great for carrying in a pocket. A clip is available separately if that's of interest, but the pen is faceted barrel keeps it from rolling off a table. Something I found very interesting was the way the inside section holding the refill is all one interlocking piece. I actually can't get the ink refill out, that's how tight the fit is. Which I find a great concept, as with regular ballpoints you have different pieces that can roll all over and get lost. Available in blue or black, mine came from Lost Crates and is burgundy with gold accents. Quite a lovely little pen, though the price is a bit steep. Writes well, but I may try to hack it with a gel ink refill to see how that works out. That wonderful Australian site NoteMaker has a great group of Valentine's Day suggestions. The reason I highlight this is something I just noticed on their email: lower worldwide shipping rates! So now I may order again and not clench my stomach when I hit the "submit" button. 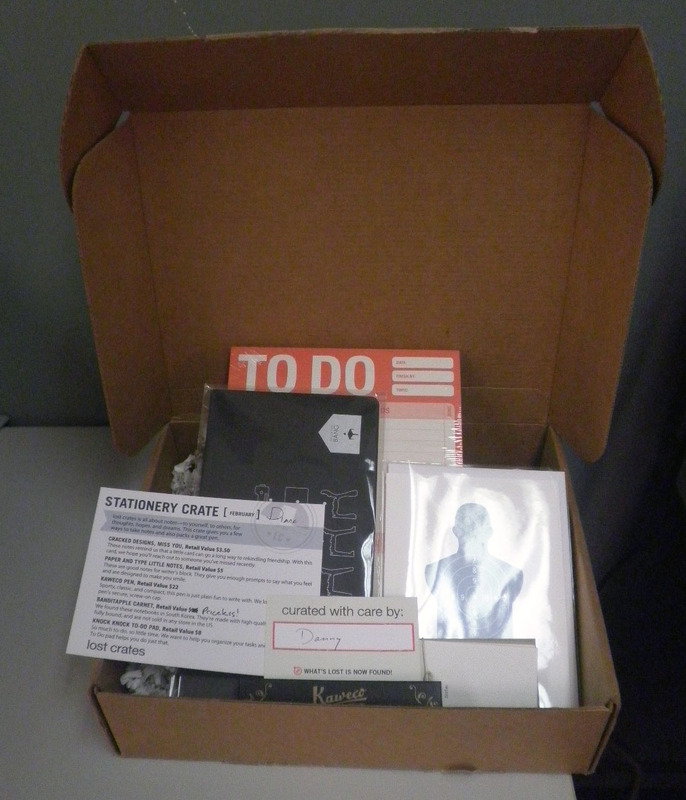 This latest Lost Crates shipment has some interesting information on the enclosed note card describing the items: the retail price of the selection. That is a great detail to add, because too often I'm wondering how much something would cost me in a store and whether the items enclosed are actually worth the price of the monthly subscription. Good idea, guys and gals! Just an FYI that Lost Crates has some new ideas coming out soon, and from the written description they are fantastic. The reveal is in a few days, and I can't wait to see some of their new Lost Crates. a Cracked Designs "Miss You" card, which is cute but just a bit thoughtless (the front of the card shows a gun target and the shooter "missed you" I would gather--yes it's a card, but I'm not sure I want to send that idea out in the world, that I missed shooting you in the stomach.). Retail price of $3.50. 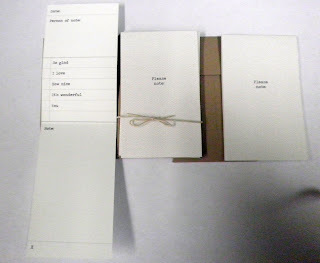 Paper and Type Little Notes, tiny note cards with prompts inside that help you express yourself. Retail price of $5.00. a Kaweco ballpoint pen, dark brown and perfect for a pocket. Retail price of $22. BanditApple Carnet, a notebook they discovered in South Korea and not found in the US, quite a nice design on the cover and an unusual shape. Retail price was crossed out and the word "priceless" inserted--quite possibly so. Knock Knock To-Do Pad, which is big enough for all my notes and scribbles. Retail price of $8. A pencil case is an important accessory if you're going to keep your writing instruments organized and protected from scratches. I have several that can handle various amounts of pens, from two or three to a dozen (although that does stretch the case quite a bit, so I try not to take that many at one time). 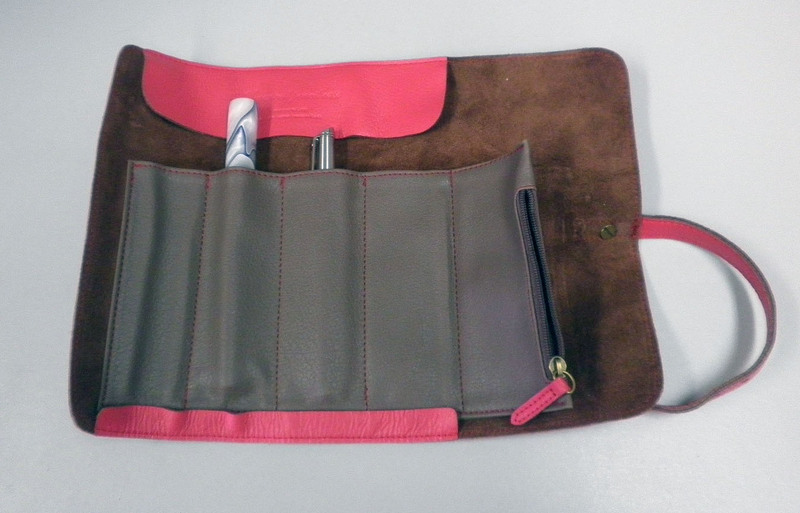 This Cplay Sevenroll Leather Pencil Case has been on my "must have" list since they arrived at JetPens, and I finally decided to get one in Sweet Cherry Red. That vibrant color won't be lost in my messenger bag, but there are quite a few to choose from if you want something a bit more subtle. The case is a roll up with a belt closure that can be loosened to accommodate larger pens. I like that it's not a tie closure, which tend to open up in my bag and spill out all my pens. The stitching looks sturdy, while the various brass pieces (zipper, grommet) are heavy but not overly so. 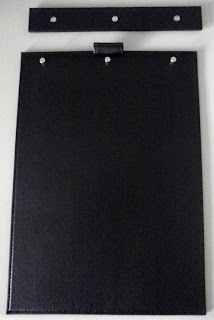 The case is fairly light in weight, in keeping with its soft leather. Scratching may be an issue, we'll have to see how this case handles being in my bag with lots of other items. But it's small enough when rolled and closed that it won't take up much room, so it likely won't get too banged up. 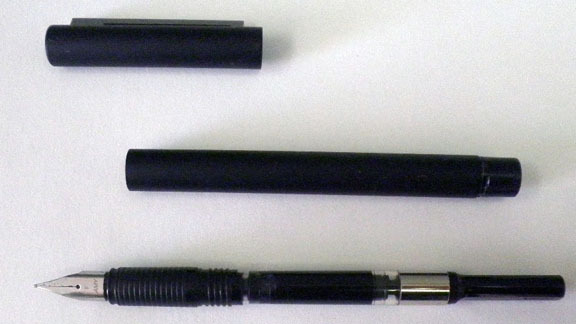 There are four pockets in this case to hold pens and pencils of various sizes, including an Edison Huron and a Waterman Hemisphere pictured above. One really nice feature is the small zippered side pocket for erasers, pencil lead refills, or whatever you want to carry--I like to keep a few dollars in different compartments like this, just in case. If you're in the market for a new case, do check out this Cplay Sevenroll at JetPens. Definitely a nicely designed and made leather pencil and pen case.